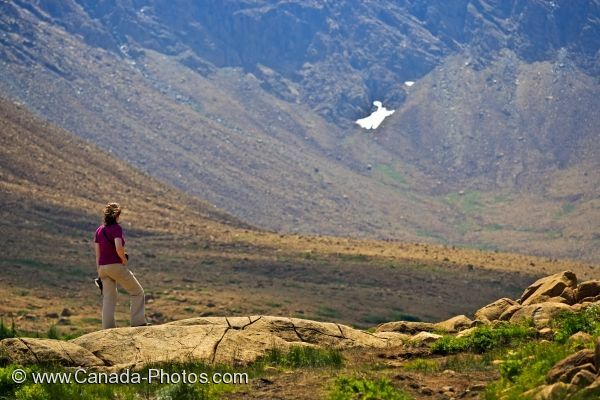 A tourist enjoys the wilderness view of the valley along the Tablelands Trail in Gros Morne Naitonal Park in Newfoundland Labrador, Canada. Hiking along the Tablelands Trail throughout the wilderness of Gros Morne National Park in Newfoundland, Canada, one can stand atop this rock ledge and see the unique land formations of the valley. Patches of snow are still seen in the crevasses which will not last long as the sun beats down upon the Tablelands landscape. Woman standing on a ridge looking up into the valley along the Tablelands Trail in Tablelands, Gros Morne National Park, UNESCO World Heritage Site, Viking Trail, Trails to the Vikings, Highway 431, Northern Peninsula, Great Northern Peninsula, Newfoundland Labrador, Newfoundland, Canada. Model Released. Picture of a woman admiring the beauty of the wilderness along the Tablelands Trail in Gros Morne National Park, Newfoundland.